Herding cats is definitely not harder than herding goats. All photos by Mars Vilaubi. Of all the tasks of an editor, attending a photo shoot is one of the favorites. It’s rare, thus refreshing. You work with interesting and creative people and, if you’re lucky, animals. You steep yourself in the sights, sounds, and smells of the world you’ve mostly seen just in print till then. And you contribute something by making sure the photos are true to the text. The shoot we held this week, for the cover of our upcoming Storey’s Guide to Raising Miniature Livestock by Sue Weaver, was an especially entertaining one. 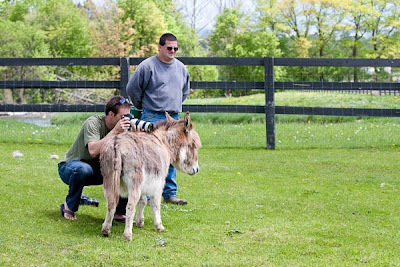 Our mission was to capture (literally and photographically) in one shot several tiny species: a miniature horse, donkeys, and goats, all of them too cute for words. Why a book on minis? By enormous reader demand. These tiny animals are popular, practical, and profitable. 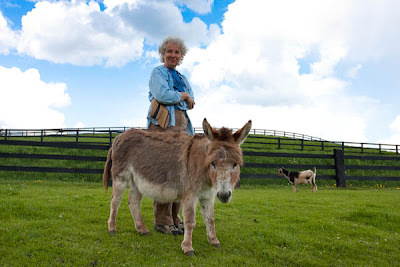 Because of their size they are much easier to manage than standard livestock. 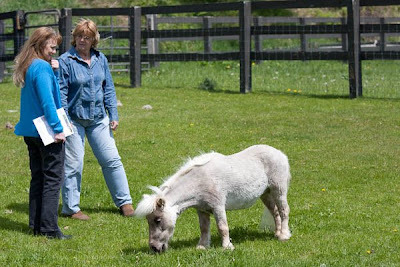 Facilities (sheds, pens, fences) can be smaller. They eat less feed but are more productive for their size. And then there's the cuteness factor. 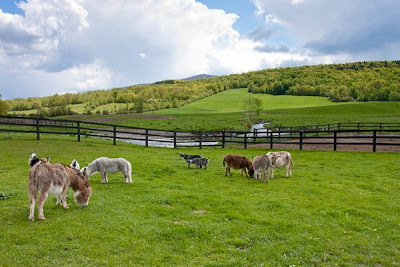 The setting for our shoot was the incredibly picturesque Green River Farm in Williamstown, Massachusetts, with emerald green pastures rolling up to wooded hills and a silver ribbon of a river winding through, reflecting the sky. The fields were full of cows and horses. A light breeze blew blossoms off the apple trees in little snow flurries, and the petals danced and hopped along the ground. 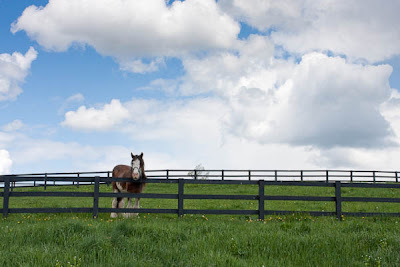 Green River Farm is a rather nice place to spend a spring morning. The four-legged stars of the show were Sequoia, a 30-inch horse out on green grass for the first time after being on a diet all winter; four miniature donkeys in various shades of cinnamon and brown sugar; and a collection of pocket-size escape artists — I mean goats: two charcoal African pygmies (Lola and Jack) and several calico Nigerian Dwarfs. The animal onlookers included llamas, supervising from the next paddock, and cows and horses in the fields. 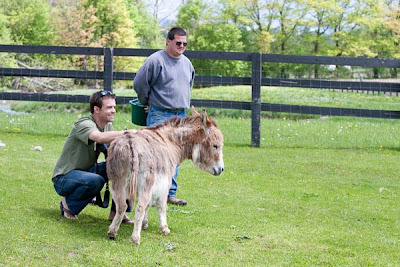 The humans in the cast included farm manager Justin Billings; his mother, Sue (who had groomed the animals); and various helpers and fence hangers. Storeyites were Cindy, art director; Sarah, project editor of the book (who was on jury duty most of the morning, so not in the photos); and Mars, our photo editor. Behind the camera was Jason Houston, farm photographer extraordinaire. You can take a look at more of his work here. I actually missed a lot of the fun because I was still at the office. 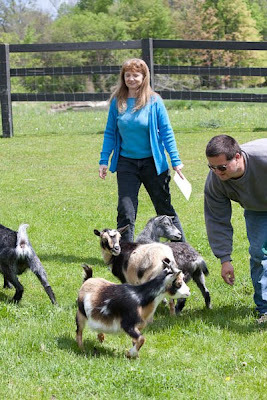 Cindy told me the entire first hour of the shoot was spent rounding up mischievous minigoats, blocking their exits from the paddock, grabbing them, and hoisting them back. 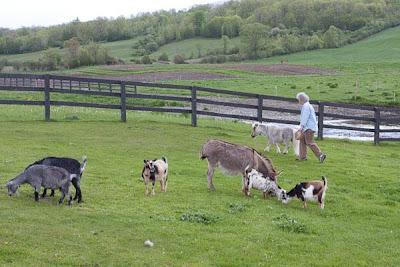 By the time I arrived, the humans were tuckered out, the critters were more or less assembled in the correct paddock, and grain was being tossed in strategic spots to focus their attention. Cindy was probably a shepherdess in another life. Now it was Jason’s job to catch the moment and compose a shot containing all the species. This is tricky enough with one unpredictable animal, but with three or more moving targets, it is exponentially more difficult. Sequoia, feasting enthusiastically on the juicy green grass, had her head down the entire morning, so at least she was fairly still, but grazing shots can be dull; we like some eye contact. We needed a group shot but didn't want to see lots of legs visually entangled or stray pieces of bodies without heads; equines should have their ears forward, and so on. Ultimately, Jason’s eye and trigger finger had to find and frame a composition that would be both beautiful and intelligible on the cover of a book. But we hadn’t bargained on April Rose's developing a crush on him. 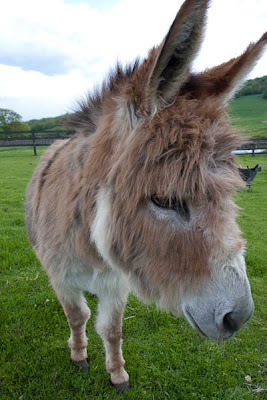 This jenny (female donkey) was always in his face or leaning over his shoulder; once he even balanced his camera on her dark spine and snapped away at the others. April Rose becomes Jason's four-legged tripod. Look for the book next spring, and perhaps consider a miniature goat in your life, but in the meantime, enjoy Mars's photographic chronicle of the shoot. This shows the scale of Sequoia, relative to Sue Jennings (in denim shirt) and me.